Recently, I was taking a walk with a coworker (something I do on a regular basis now). While we were walking, we were talking about my plans to retire at the end of the year. He then said something I thought was interesting… “You guys deserve it – you’ve sacrificed a lot to get where you are.” Sacrifice? Obviously, his intent was good (he’s a great guy! ), but it’s a bit shortsighted. And unfortunately, it’s a common mindset that many folks outside of the personal finance community have. The thought is that if you get to the point where you can retire early, you must have either gotten paid a ton of money or really had to sacrifice a lot in life. Well, I’m here to tell you that neither of those has been the case with us. And I’d imagine that there’s a solid percentage of folks on the road to financial independence in the same boat. 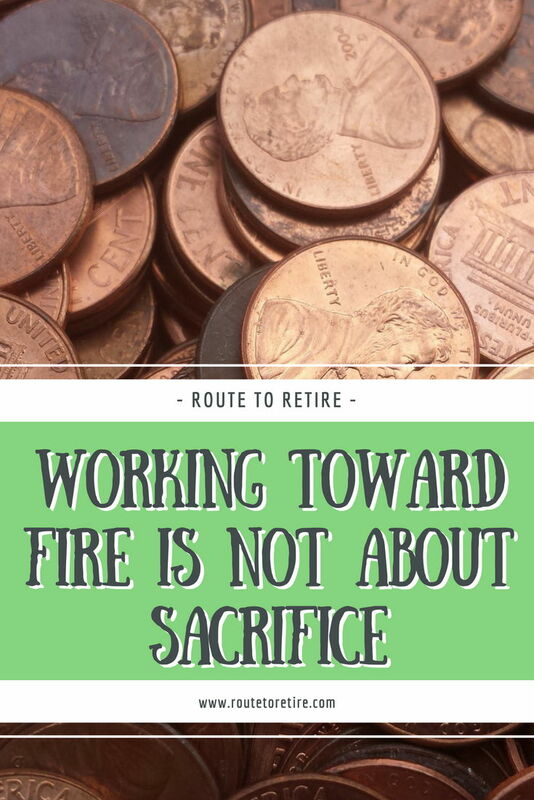 We’ve definitely made some changes in our life, but sacrifice isn’t a word I think fits on our path to FIRE (financial independence / retire early). We live in a nice house in a great development. We vacation regularly (more than I feel like we even have time for!) and always seem to have something fun going on! And we buy the things that make us happy. How perfect is this photo? It’s as if it was made just for this post! 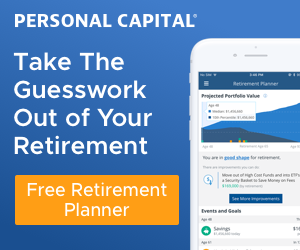 You’ll find in the personal finance community that there are two methods of expediting your way to financial independence… make more money or cut back on your expenses. Neither is wrong by any means. Some folks take frugality to the extreme. They can stretch a hundred bucks more than most people could ever dream of doing. It’s really a skill to some degree. The notorious Mr. Money Mustache and Mrs. Frugalwoods are a couple of the more well-known names in the community who know how to make a dollar last. They’ve learned that buying crap doesn’t make you happy. They’re also more on the extreme end of frugality. There are also the minimalists who have found a way to get rid of all the “stuff” cluttering up their lives. In their case, less is more. 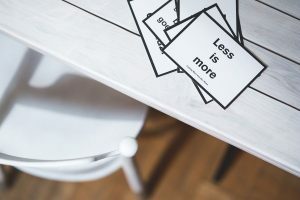 By eliminating all the needless junk in their lives and downsizing their homes, their expenses become so low that their savings rate can skyrocket. Then there’s the other side of the coin, which involves making more money. I talked about a few of the options for making more money in my post, There is a Secret Formula to FI, But It Ain’t No Secret!. Regardless of how you decide to bring in more income, if you can maintain your current lifestyle, you’ll obviously be able to increase the amount you can put toward your future. In between “what you earn” and “what you spend,” there is a gap. Your job is to make this gap as wide as possible. That fits well in this section. Moreover, there’s no reason why you shouldn’t combine both tactics for a more powerful strategy. Regardless of whether you decide to make more money or spend less, each step puts you just a little closer to financial independence. But, do you really need to take it to the extreme to reach FI? The misconception about reaching early retirement is that you’ve had to sacrifice something to get there. I mean, if so few people seem to be able to do it, it must be because they’re missing out on all the fun stuff, right? When I look back at our path to FIRE, I don’t see that at all. In fact, I don’t think we’ve missed out on anything. By focusing our time and money on the things we value, we’ve found our way to FIRE. What I do see as a difference in how we handle money is that we prioritize what we find most important. And that’s what we spend our money on. Let’s use a cruise vacation as an example. We love going on cruises – not sure if my site header or avatar gives that away at all! So guess what? We’ve been on a number of great cruise vacations over the years and have had some fantastic times. When we book a cruise, we aim for lines like Princess or Celebrity (though with our upcoming cruise, we’ll be trying out MSC Cruises). If you’re familiar with cruise prices, you might wonder why we don’t go on Carnival. After all, they do tend to be the ones with all the deals. Very true, but we’ve done a Carnival cruise years ago and just didn’t enjoy it very much overall. So, we generally book the lines that tend to be more expensive. Additionally, when we book, we make it happen with a balcony room because… well, once you get a balcony, you can’t go back! My favorite part of the cruises is to just sit on the balcony at night (usually with a beer in-hand), hear the sounds of the ocean, and look out at a night sky filled with thousands of stars… I love it! So let’s get this straight… we’re booking a cruise vacation on a pricier line and making sure we get a balcony. So far, I’m not seeing much sacrifice! We don’t need the fancy packages that include massages and spas. We don’t care about the fancy drink packages with the upper shelf liquors or the imported beers. We don’t need a giant suite to accommodate us for a room we just sleep in. We prefer to explore on our own and don’t end up booking excursions through the cruise line. We barely even look at souvenirs because we enjoy the experiences more and don’t need “things” to go along with it. So… we skip all that stuff and that saves us a tremendous amount of money on the vacation. In other words, the upsell isn’t that important to us. And that’s not me saying that these things aren’t good for others – it’s just that we personally don’t care about them so why spend the money? However, it’s not a matter of us just running on the cheap. For instance, if we’re on the ship and decide we’re in the mood for a craft beer or a mixed drink, we get it – no big deal. Or if we would decide we would want to do an excursion once off the ship, we’ll do it. We’re also picky about finding deals for the cruise and the flight. But it’s a cheap hotel because it’s just a place to sleep for the night. We just don’t get FOMO from not having every luxury or add-on. In other words, we buy what makes us happy and don’t vomit up additional money just because it’s a vacation. This is just one example of how we live below our means but don’t cut out the things we love. We also drive 8-10-year-old cars, shifted to Total Wireless, and cut the cable years before it was cool to do so. Those are things that we don’t care about, so we don’t waste our money on things like fancy cars, expensive cell phone plans, or a $200 cable package. However, we live in a big house (too big!) in a nice neighborhood. 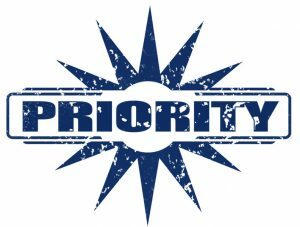 To each his/her own, but the key to our success is figuring out our priorities and cutting out the expenses for the things we don’t care about. With all of that said, I would say that the one sacrifice that we’ve made is time – mostly mine. Although it’s not 100% necessary, I started trying different side hustles over the years to bring in more income. Like the sands of time through the hourglass… blah, blah, blah. I’ve written a couple of books in the past and decided to do most everything myself – and that includes publishing the books. Writing a book is time-consuming. The first time around, it took me almost a year to get the book written… longer than I thought it would. The second time around, I forgot how time-consuming it was. Oops. So I went through it all over again. However, these were passion projects. I knew I wouldn’t make a lot of money with them, but holding that finished printed copy of a book in your hand that you wrote is a phenomenal feeling. So, although writing these books cost me a lot of time, I wouldn’t look at that as a planned move toward financial independence. At one point, we owned two rental properties – a single family home and a duplex. We recently sold the house though, so we’re now left with just the one property. I wanted to own real estate ever since I read some of the Robert Kiyosaki books like Rich Dad’s Cashflow Quadrant. Just because I wanted to own real estate, though, doesn’t mean I wanted to manage it. So I got a property manager right from the start. However, it’s tough to find a good property manager so you end up spending more time than you want managing your manager. That cost me some time for a while, but now I think we have a pretty smooth operation going. I also spent a lot of time learning about real estate. The funny thing about owning property is that you start out stupid and learn as you grow. Like many things, it gets easier each time because you’re now more knowledgeable and have more experience. My guess is that folks like Chad at Coach Carson have a pretty good system in place now. They know how to screen the deals quickly and turn ’em around for rent effectively. I’m sure there are still some speed bumps along the way, but nothing like it was at the beginning. I do hope that I’ll be able to leverage some of what I’ve learned to buy another property or two at some point down the line. Funny enough, this site is the most time-consuming project I’ve ever gotten involved with. And that’s Ok because I love it. But, it’s definitely a struggle to put in the time I want to with it while I’m still working. The good news is that I started this with the intention of it growing and being able to fill some of my time once I retire… and that day’s coming soon! So when it comes to sacrifice, Route to Retire is really a time-sucker. It’s also not a huge money-maker, but it’s on the right track to be soon enough. The more I think of these side hustles, the more I realize that I didn’t really sacrifice much with them. I got started down the road of all three of these because I enjoyed them. This is really no different than spending your time watching Netflix – I just choose something I enjoy that happens to bring in money as well. Overall, I don’t feel like we’ve really had to make many sacrifices to get where we are. We’ve reached financial independence because we make intentional decisions. However, the decisions we make don’t make us any less happy. We love our life but have positioned ourselves to be able to reach an even better adventure when I jump ship from work at the end of the year and we head to Panama! Do you think you need to sacrifice things in order to reach financial independence or FIRE? Unfortunately, I think some people may want it ALL and would feel like there are making sacrifices. It’s different for everyone, but if you’re not sure if you’ll enjoy it, maybe do a smaller 4 or 5-day cruise. Carnival can be a party cruise line with more of a spring break atmosphere (at least the one was that we were on). However, I’ve heard their Alaskan one is really good. We enjoy Princess the most, but Celebrity was very good too. We didn’t do Royal, but that’s supposed to rank on the same level as Princess. Start with Cruise Critic to get a better feel for what your choice are. Take advantage of eBates and/or a warehouse club like Costco Travel when booking and you’ll come away with some extras as well. Use a credit card that offers travel insurance. We seem to focus on the Caribbean (Eastern and Western are both good) because I’m a freeze baby, but those Alaskan cruises are supposed to be fantastic! Depends on what you like. The same goes for the size of the ship – the larger ones have more “stuff” but the smaller ones seem more personable. We usually like ’em right in the middle. Always arrive the day before and stay at a hotel. The ship won’t wait for you if your flight is late unless you book it through the cruise line. If you book shore excursions, they’ll cost more on the ship than they would if you just book directly through a company beforehand. However, the ship will sell you on the fact that they vet the companies they use and guarantee the ship will wait if your excursion runs late. Either way works just fine. The Ship Mate Cruise App is nice and is a great place to read reviews and ask questions. Whatever you decide, don’t try to cram too much in. Just go with the flow and enjoy it. More than you probably looking for, but hopefully it’s somewhat helpful! Thanks, Mrs. AR – wow, you’re on top of your podcast listening! How am I always behind on these?! So glad I ran into this site and subscribed to your emails. I love the idea of FIRE and I am a very frugal person, but never enjoyed the idea of going as far as MMM and being completely frugal to the point of barely enjoying myself. Its all about prioritization! Keep the great content coming and congrats on your upcoming retirement! Thanks for subscribing and for the congrats, Aaron! There’s definitely no right or wrong way to reach FIRE – it’s going to be a personal journey for each of us. The key is to have a plan that works well for you. Good luck on your journey! Thanks, Bob – it took me a while to realize that having a balance on the path to FIRE is important, but it definitely is. We do love our cruises, too! They’re not for everyone, but they’re my favorite type of vacation by far! I have a hard time with this question too. From my point of view, it’s not much of a sacrifice, but it looks like it from outsiders. We share one car and live in a smaller than normal home. We don’t eat out as often. There are things we do to be frugal. They are not sacrifices to us because it feels normal now. Good post. It’s not about sacrifice. It is all about your mindset. What is important to you and what isn’t. I am a frugal person and I don’t feel I have sacrificed in regards to saving my money. I am happy and enjoying my life and family. Enjoyed your post. Thanks, Dan – sounds like you figured out the key before I did! Figuring out a comfort level while still living below your means puts you on the true path to happiness. All very helpful, not too much at all. Remember we have never done one before! So agree. Sacrifice doesn’t deliver on the goal, maximizing life across all years. Not just the future and not just now, both. Instead mindful decisions is what works best for most people. Waste not want not. Great post – I couldn’t agree more. So many times when I start talking to friends or co-workers about our plans, they say something along the lines of “Well, you keep to a really strict budget…”. That’s just not true! 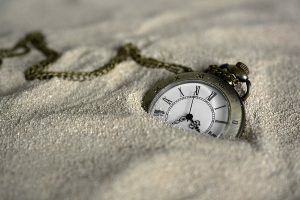 I think it is really a matter of limiting beliefs – until someone realizes that it is possible for them, they don’t want to believe that somebody else could be saving for FI while also living in the moment and enjoying the here and now. It’s almost like the world of FI and FIRE is a completely different unheard of world out there! Once you open your mind and realize how straightforward this can be, it can be a real eye-opener. I’m in agreement with you Jim. We made it to multiple millions without sacrificing a thing. We did change what we wanted in life, but that’s not a sacrifice. It’s funny how just some intentional changes can make all the difference! I think as you said, it’s more about intention than sacrifice. In the process of designing an intentional life, I’ve discovered what brings me the most joy, doesn’t cost money. Jim, it sounds like you have a very rich, fulfilling life. No sacrifices here! We made choices along the way that got us to FI. (we are not at the RE part by choice). We did well salary wise on one income. We spent below our means but have not been so cheap that we have the FOMO thing. Look up the word eudemonia in the dictionary and you’ll understand where I am coming from. Great post. Thanks, R2E – sounds like you guys did it the right way for sure! Enjoy today on the way to preparing for tomorrow! Definitely not about sacrifice. It’s just about identifying what you value and cutting the things that you do not. Your example of living in a great house in a great community. We absolutely love our community but we had way too much house. We significantly downsized and moved right up the road in our development. We never feel deprived in the pursuit to FIRE. That’s sounds like the best solution to get the best of both worlds… nice job on that!